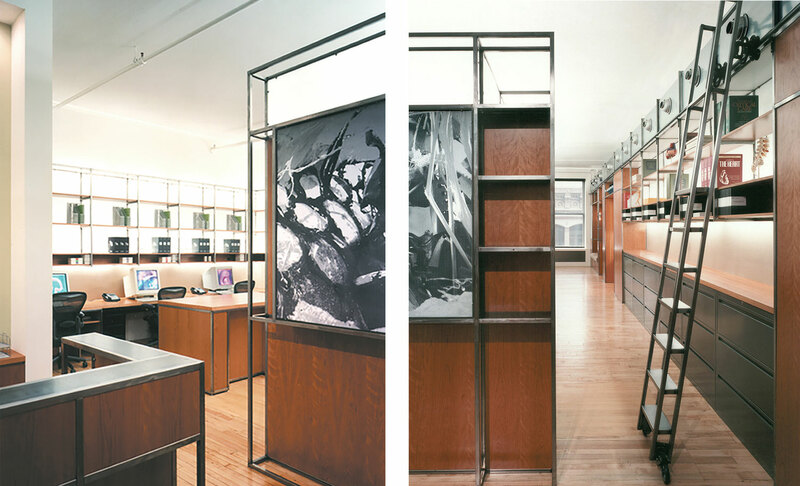 We designed offices for Hurd Studios, a publications and media consulting company, within a landmarked building in Manhattan’s Soho district. The existing space was very small, and Hurd Studios space needs were large, so we employed a strategy of extreme efficiency—making every square foot count. Wall surfaces were not simply dividers between spaces, but were built out to the ceiling with files, shelving, lounge furniture, and many other functional items. Ductwork, pipes, and other utilities were exposed and woven in to the design as an integral part of the space. Offices were small, but designed with translucent panels and indirect lighting in order to make them feel large and comfortable. The construction system was also unique, given the tight access and occupied floors below and above. A steel frame was assembled in the space, and pre-cut panels of wood, translucent fiberglass and other materials were inserted into the frame. The resulting space is warm and comfortable, while being functional and easily modifiable. Creative use of common materials and the employment of non-typical trades, such as garment-rack welders to assemble the steel frames, allowed this complex and beautiful space to be realized within a very limited budget.